Neil Gaiman's Journal: Why is the man on the right holding a microphone? Why is the man on the right holding a microphone? I did the Washington Post Book World online chat this morning -- http://www.washingtonpost.com/wp-dyn/content/discussion/2008/09/09/DI2008090902030.html and then did more telephone interviews (while also signing the sheets for the Subterranean Press edition of The Graveyard Book) after which Euan Kerr from National Public Radio in Minneapolis arrived. I've known Euan for over a decade, but in the past I've always gone to the studios of KNOW in St Paul while he interviewed me. This time (because time is ticking before the start of the tour, and there isn't any to spare on things like driving out to the Twin Cities) he came out to my house. On arrival he donned a bee suit, and headed out with the bee team (me, Stitelers, Lorraine, Cat Mihos who is in town visiting Lorraine and who, fresh from Duran Duran and the Jonas Brothers, will be tour-managing some of the upcoming tour) to harvest honey. Euan sort-of-interviewed me while we did bee stuff, occasionally sticking his microphone down among the bees to capture authentic beeish noises, then afterwards we went together to the gazebo and did a proper interview, with actual questions and answers and things, and not just barked cries of "Can somebody please hold this?" and "Ow, I just got stung through my sock." The first interviews when a book comes out are the fun ones, because you're finding out what you think: all the questions are new to you, and you're having to figure out what the answers are, and you aren't yet repeating yourself. The hard ones will be in a month, where I'll find myself thinking Did I ever really live in a very tall house? And did my infant son really ride a tricycle around the churchyard across the lane? Are these real things, or just things I've repeated so many times they've evaporated, so now all I remember is the memory of me saying them...? Hello! I received the e-mail about your appearance at the National Book Fest, which I'm very excited about. In this e-mail, it said that you'd be doing signings, and that I should buy a copy of the Graveyard Book for you to sign. Buuuut, if it won't be available for me to purchase until September 30th, how can I have it for you to sign on the 27th? I'm confused, which I'll admit isn't an uncommon state for me. Will there be copies available in the Book Sales tent? Don't get me wrong, I'd be immensely happy for you to sign something else that I already own, but I'd love to know how this whole Graveyard thing can work, unless you have some sort of nifty time travel device that you've been working on in your spare time. 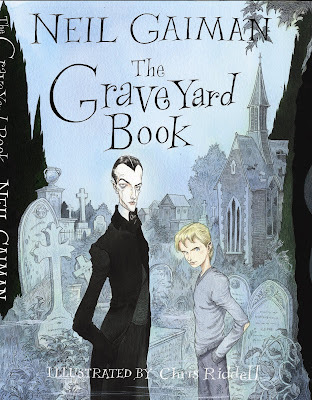 We have a special dispensation from Harper Collins to sell copies of The Graveyard Book at the National Book Festival (because it's, well, the National Book festival). The only downside on that is I don't think that copies sold on the Saturday will count on any of the bestseller lists, which start ticking on Tuesday night. But it would be silly to be there without books, and it's only three days, and I'm glad that Harpers thought it was a good idea. http://www.davemckean.com/ is now almost there. It has a front page up anyway. I'm sure that as soon as it goes live it will also have contact information. So that will be how people will contact Dave in the future. (And he's signing in Paris on the 4th of October). When Kitty arrived she was wearing a new tee shirt which made me smile, as on it was a drawing which I'd done earlier this year when asked by Bloomsbury for a sketch of the kind of thing I was thinking of for a Graveyard Book cover, something they could show to Chris Riddell*, which I then sent Kitty when she asked about making a Graveyard Book tee shirt for Neverwear.net, to show her the kind of thing that was in my head when I was writing it, and the kind of direction that might be nice to go. I didn't expect it to be a t-shirt, and I didn't expect to like the t-shirt that it became, but it's lovely. even at the table or on the kang (bed). by clapping hands in the sky.